May is soldiering on and so is my household crafting! I have to say I am getting really excited about this task and I have well and truly got crafting fever! It’s a relief as some months ago I was having a complete crafting lull and wondering if my creative streak had become dormant. Thankfully not, if not for my sake for the sake of my spare room which is stuffed with random beads, ribbon and fabric swatches. 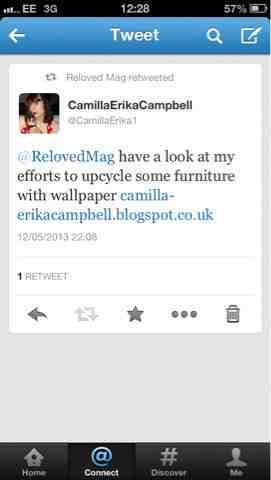 After my last blog I decided to share my work with the newly published Reloved magazine on Twitter, and to my delight they re-tweeted my blog. So if you have found me via Reloved magazine then welcome! Recently I have been putting down the sewing needle and picking up the paintbrush. Ever since I moved into my house I had aimed to paint the kitchen. 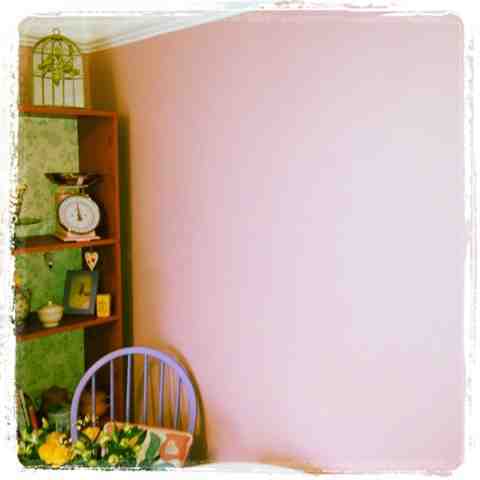 I’d seen a gorgeous colour of pink in B&Q and bought 2 tins without actually planning the room it would be used for. About 12 months ago I painted a swatch on my kitchen wall and thought yes.........this is the colour I’ll use to paint my dining part of my kitchen. It has taken me until now to do it, although to be honest I think it was more the task of deep cleaning the grimy greasy walls that stalled it for so long, plus the fact that at present our overhead extractor fan only actually extracts to the top of the cupboards........not so pleasant, however I’m happy to say that is also in the pipeline to be changed. After my bookcase revamp in the kitchen I decided just to get the paint brushes and rollers out and just paint the wall. I’m pretty happy with it, I mean its pink but it’s a grown up, sort of dusky vintage pink which happens to compliment all my other revamps quite nicely. 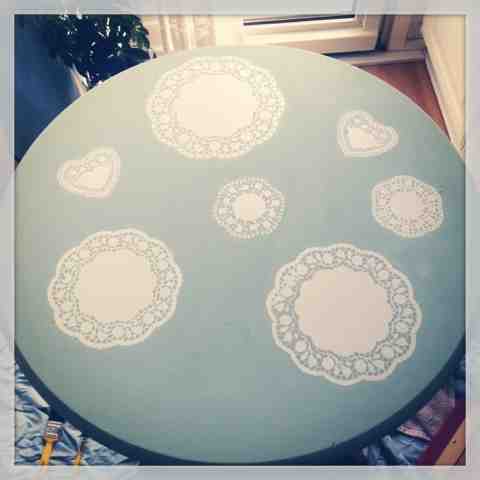 I also want to share with you my other paint related project, my doily screen printed table! This I’m particularly chuffed about. 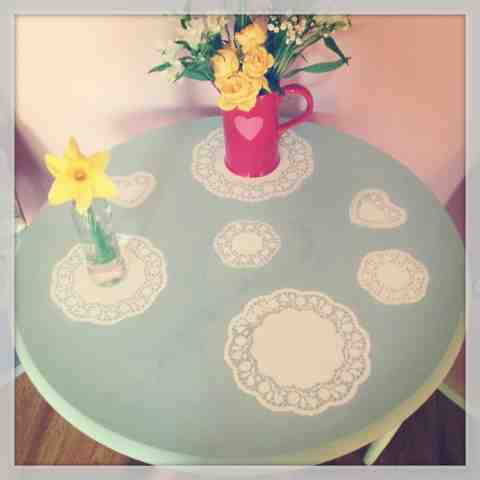 Read below to see exactly what I did to my new glamorous kitchen table. 1. Once you have found the piece of furniture you wish to revamp you first need to prep it before you can paint it. First give it a wash with some soapy water to lift off any grease and dirt and dry it down. 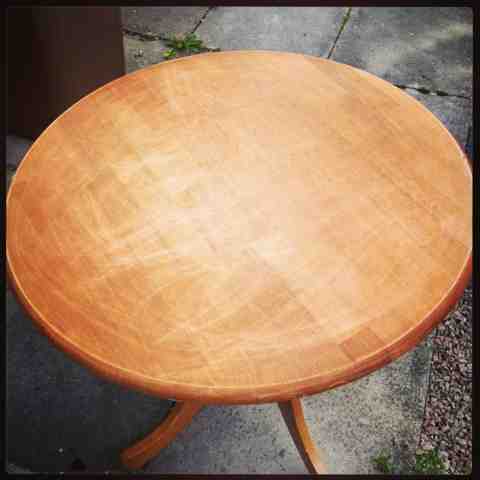 If the piece has been painted or varnished before you need to use sandpaper and sand all the paint or varnish off. This will help key the surface and give the paint some grip. Once you have sanded your item give it another wipe down and leave to dry. 2. With my design I wanted to create a two colour effect so before I could screenprint I had to paint a layer of white paint as a base. I just used water based paint designed to be used on wooden interiors. To keep the paint looking even I used a mini roller compatible for use with water based paint, painted a thin layer and then did a second coat. Now comes the waiting game, you can’t do the next part until it is completely dry so lights out and let it dry overnight. 3. Now for the fun part! 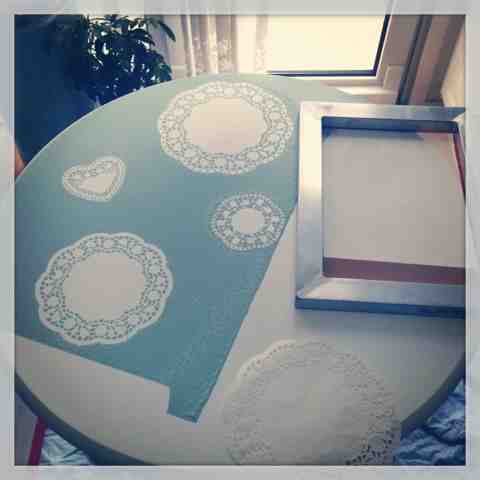 Take your doilies and lay them on top of the table, play around with your design. Try a variety of shapes and sizes and don’t overcrowd your table too much, you want a nice balance of the white and coloured paint. Paper doilies work well for this project as they are thin and act as your stencil, don’t be tempted to try it with a fabric doily, not only with you ruin it but the thickness of the material means that you won’t manage to get a nice neat and sharp print. 4. Once you are happy with the layout you can begin to print, remember that the part of the table which the doily covers will remain white, whereas the rest of the table will be the colour you selected to screenprint, in my case duck egg blue. If you are not familiar with how to screenprint you can find good tutorials by googling screenprinting tutorials. 5. Ideally you should have a screen which is large enough to cover the area you want to print, unfortunately my screen wasn’t so I had to do a bit of fiddling about – it also means that you should really wait for your first side to dry before you print the next side – I couldn’t wait that long! The key thing is that when you are printing you want to be firm and even, you want to make sure the paint goes through the screen and the doily cut outs without spilling through too much and producing undefined lines. You will probably need to pull the squeegee across your screen and back again in 2 cycles. 6. Once you have printed, CAREFULLY peel back the screen, you may find that some of the doily has stuck to the table, don’t worry just very carefully peel it off. If you need to touch up any bits use a paintbrush and blend the paint in, leave to dry and then coat with some varnish to help seal the design in. There you have it! 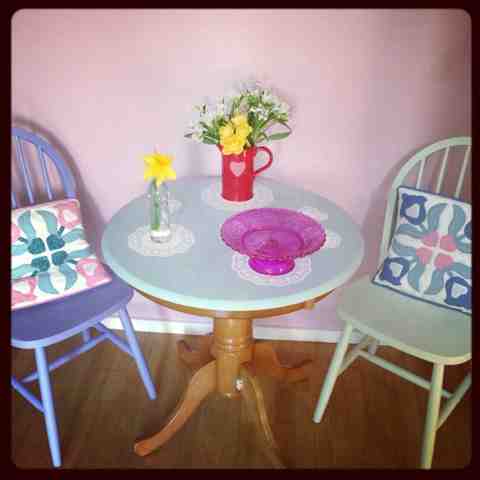 A beautiful feature table perfect for afternoon tea and cakes. As you can see the colour compliments my wall and previously painted chairs wonderfully. 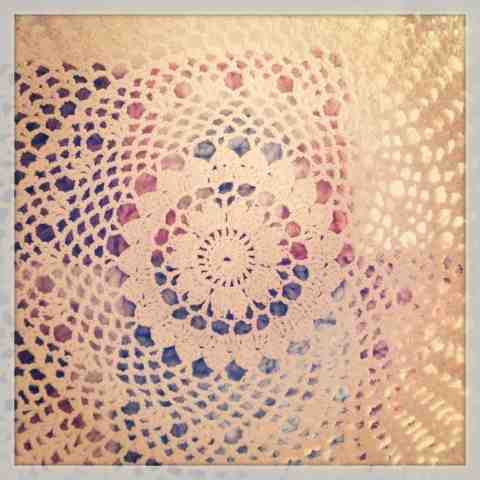 Pssst, I have one more really quick doily make! 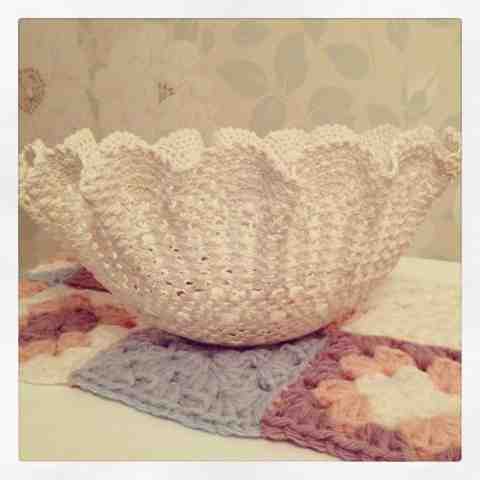 This time you use crocheted doilies that you can find from markets or charity shops to make a beautiful decorative bowl. 1. Ideally you should use a small doily as you will be able to make a smaller more robust bowl, I only had a large doily and although very pretty my bowl is very delicate to use. Wash your doily and iron it . 2. 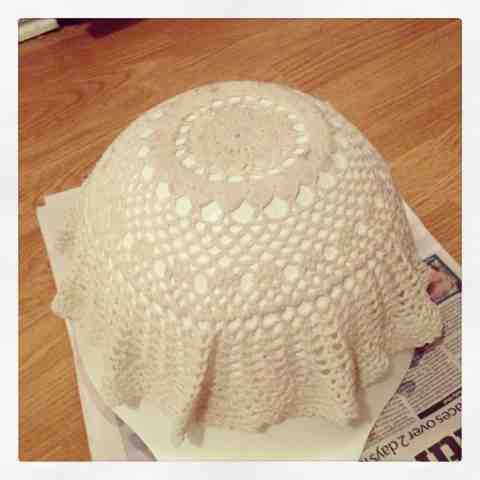 Find a bowl that you can mould your doily around, this is how you will form your doily shape. Put the bowl face down with the base facing upwards and pop your doily on top. 3. 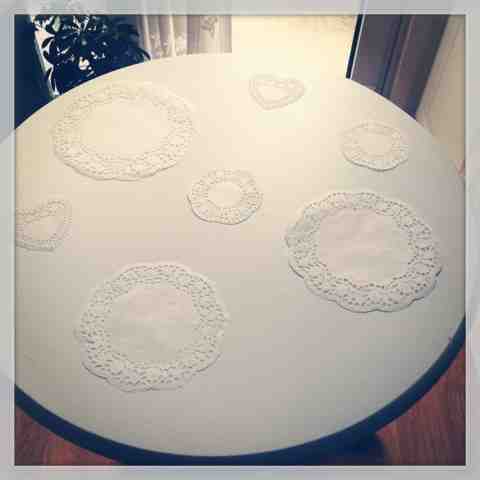 Wet your doily in starch, this will harden as it dries and sets the shape. I needed a lot of starch and soaked my doily, however for a smaller doily you will not need as much. Spray enough to wet the doily, to create a pinched edging for the top of your doily bowl work your way around the doily and pinch together and mould the doily to show you want your bowl to look. 4. Leave to dry, you will need to leave until it is completely dry, this could even take longer than overnight so be patient. 5. 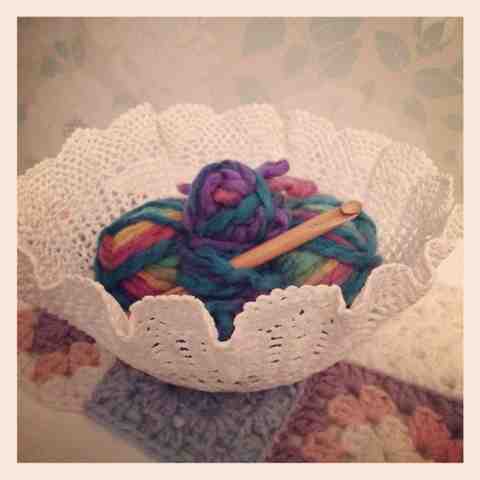 Once dry take it off the bowl and there you have it, your very own doily bowl! The beauty of this project is if you get fed up or it starts to lose its shape you can pop it in the washing machine and start all over again.